Diving holidays far away from any kind of mass tourism. Tondoba Bay is located 14 km south of Marsa Alam city, directly in front of Shaab Samadai/Dolphin House, a natural dolphin nursery ground. Tondoba Bay is a eco tourism pilot project with a maximum capacity of 30 divers per week. We take you more personally and you will dive far away from mass tourism. Blue Heaven Holidays diving center is located directly at the beach with easy accesible house reef. It is a PADI 5* Instructor Development Center (IDC), VDST/CMAS Member Center and ISO certified. We are doing diving courses from beginner to professional with PADI, CMAS or VDST standards and offer special children diving programs. Over 30 dive sites, such as famous Elphinestone, Habili Heaven and the newly discovered Plastic Wreck, are visited regularly. Affiliated is the Marine Biology College MBC (VDST Marine Biology Training Center) where divers can join marine biology seminars, speciality courses and Reef Check Events. 5 days diving package including 2 dives per day by boat, zodiac or jeep (shore diving), including additional house reef diving between 8:00 h in the morning and one hour before sunset. 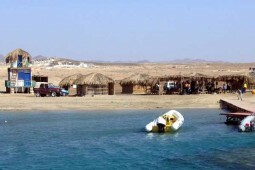 Eco diving at the southern Egyptian Red Sea with virgin house reef, biology center on site and without mass tourism. Blue Heaven Holidays takes you more personal. Welcome to a holidays of a different kind.